… are the ideal heating and cooling systems for successful and comfortable energy savings. The water filled radiant heating and cooling systems are used for the implementation in ceilings, floors and walls. They are characterized by their extremely flat construction and, therefore, ideally suited for retrofitting of existing buildings. The used capillary tube and hose systems are completely corrosion resistant. The cooling and heating surfaces work with a surface temperature of 19 °C for cooling and only 26 °C to 29 °C for heating so that even in the heating mode, energy emitted by humans is transmitted to the ’active’ room surfaces. This results in a constant gentle radiant exchange between both. The heat exchange takes place at 60% of radiation and 40% of convection (air-current). This corresponds to the natural heat regulation of the human body. It is proven that the well-being and productivity of people in such environment is increased. 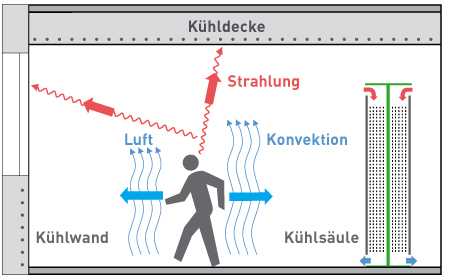 Due to the large exchange surfaces, also at small differences between the active surfaces of the room and the room air (maximally 5 °C), large amounts of energy are transferred without drafts and noises of conventional systems. This floor heating with capillary tube mats can be placed directly under the floor covering on the screed, on the drywall panel or in the screed. The capillary tube mats are integrated either under layers of plaster (PP-Ultra), in the floor (PP-Floor), on drywall panels (PP-Combi) or inserted in metal cassettes (PP-Meta) into the room enclosing surfaces like ceiling, wall and flooring. There they are connected hydraulically to the supply and return lines. The hydraulic systems consist of corrosion resistant materials (polypropylene, copper or stainless steel). Both heating and cooling is provided by just one pipe system. The thin parallel-guided capillary tubes (4.3 x 0.8 mm) are incorporated homogenously into the distributor/collector and welded into mats. Spacing strips (Omega strips) ensure the parallel distance of 10 – 30 mm between the capillary tubes. The capillary tube mats, pipes and fittings are made of polypropylene. Polypropylene copolymer (random copolymer type 3) has a high molecular weight and is characterized by its high tensile strengths, hardness and stiffness. 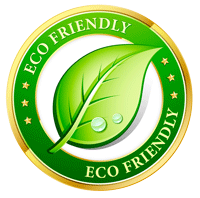 And, the used synthetic material has a useful economic life of more than 50 years. Materials made from PP comply with the requirements of fire classification B2 according to DIN 4102 T2 and are, therefore, normally flammable. Since PP is composed exclusively of carbon and hydrogen atoms, during combustion no pollutants are emitted. One feature of the capillary tube systems is the oxygen diffusion through the polypropylene capillary tubes and fittings. The oxygen exchange between the ambient air and the circulating water takes place until the oxygen saturation point is reached. To protect the system against oxygen caused corrosion and accumulation of mud; the power generation circuit are separated hydraulically from the capillary tube circuit by insertion of a heat exchanger. These results in two independent hydraulic circuits: the primary circuit carrying the heating and/or cold water generator and the secondary with the capillary tube system. The secondary circuit is 100% corrosion resistant and, therefore, it has a very long duration of life. The flexible tube systems are integrated either into layers of plaster (Single-Ultra), on drywall panels (Single-Combi) or in metal ceilings (Single-Meta). Since the tubing is made of oxygen-tight material it can be connected directly to the existing tubing system even if it is not corrosion resistant. However, a separation system and corrosion resistant feed lines at the secondary (supply line to the radiant panel heating) are always recommended. Only a separation system and corrosion resistant supply lines guarantee a long duration of life. The tube system is characterized by its high flexibility and adaption to built-in components in the active areas. Changes of the system on a short notice can be done on site. The tubes of the Single-Combi and Single-Meta-System are integrated into an aluminium heat conducting profile. This results in an optimal heat conducting contact between the radiant ceiling system and the hose. The copper systems are suitable for drywall ceilings (Cu-Combi) or metal ceilings (Cu-Meta). These systems are particularly suitable for rooms with increased fire safety requirements. Since the system is oxygen tight, it can be connected to any other piping system. In combination with the climate system, an appertaining control system should be used to regulate the supply temperature for heating and cooling and for room temperature control. To prevent damage to the surfaces caused by condensation water, a dew point sensor should be installed.